Psychological treatments available for specific phobias have been refined considerably in recent years. This extensive handbook acknowledges these treatments and includes the description and nature of prevalent phobias, details of symptoms, prevalence rates, individual case histories, and a brief review of our knowledge of the aetiology of phobias. Key knowledge about phobias is brought together in this one critical and accessible handbook, which saves the busy clinician time and provides an authoritative guide to the literature. It is systematically compiled to act as a working tool providing an integrated, contemporary account of prevalent specific phobias, their treatment and theoretical issues concerning aetiology. The Handbook also reflects the important role of cognitive factors in psychopathology which generate and maintain phobic disorders, a process that is now recognized as important in their understanding and treatment. 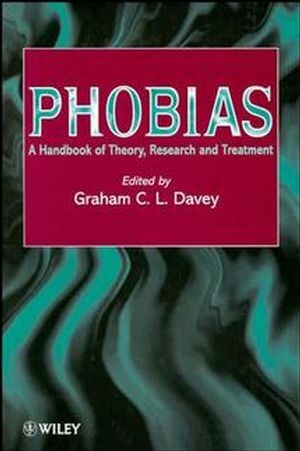 "The joy of Davey's book is that it skillfully blends the historical conditioning theory perspective with current cognitive-behaviour theories ... the result is a complete summary of current knowledge about phobias, for clinicians and researchers ... an invaluable handbook and an essential summary of the status of theory, research and treatment in phobias. It is highly recommended to researchers and to both novice and experienced clinicians." Graham C. Davey is Professor of Psychology at the University of Sussex in Brighton, UK. He has been an active researcher in areas associated with anxiety and its disorders, especially pathological worrying, phobias, and perseverative psychopathologies generally. He has published his research in many high-impact international journals including Journal of Abnormal Psychology, Behavioral & Brain Sciences, Journal of Experimental Psychology, and Behaviour Research & Therapy. He has authored or edited a total of 11 books, including Davey, G.C.L. (1997) (Ed) Phobias: A handbook of theory, research and treatment, Chichester:Wiley,andDavey, G.C.L.&Tallis, F. (1994) (Eds) Worrying: Perspectives on theory, assessment and treatment, Chichester: Wiley. He was elected President of the British Psychological Society from 2002-2003. THE NATURE AND DESCRIPTION OF PREVALENT PHOBIAS. Social Phobia: A Cognitive Approach (A. Wells & D.Clark). Agoraphobia (P. Salkovskis & A. Hackmann). Blood-Injury-Injection Phobia (L. Ost & K. Hellstrom). Animal Phobias (S. Thorpe & P. Salkovskis). Specific Phobias in Children (T. Ollendick, et al.). Rapid Treatments of Specific Phobias (L. Ost). A Comparison of Behavioral and Cognitive Treatments of Phobias (M.Craske & M. Rowe). The Use of Medication in the Treatment of Phobias (P. Hayward &J. Wardle). GENERAL THEORETICAL PERSPECTIVES ON AETIOLOGY ANDMAINTENANCE. A Conditioning Model of Phobias (G. Davey). Evolutionary Models of Phobias (H. Merckelbach & P. deJong). Unconscious Pre-Attentive Mechanisms in the Activation of PhobicFear (A. Ohman). The Match-Mismatch Model of Phobia Acquisition (A. Arntz). Information-Processing Approaches to Phobias (C. Cameron). The Epidemiology of Fears and Phobias (T. Chapman).